It's the first time that Israel has ever announced strikes against Iran inside Syria and in real time. Moments after a massive wave of rockets were fired on Damascus, activating Syrian anti-air defenses Sunday night, the Israeli Defense Forces (IDF) announced: "We have started striking Iranian Quds targets in Syrian territory. We warn the Syrian Armed Forces against attempting to harm Israeli forces or territory." Sustained Israeli attack on Damascus overnight Sunday, via local Syrian sources. This is unprecedented given that in every other among the dozens of prior recent Israeli attacks on Syria, the IDF has never acknowledged responsibility so quickly and certainly not while they are ongoing, usually declining to confirm or deny after the event. Twelve hours prior the IDF said its Iron Dome Aerial Defense System intercepted a Syrian rocket fired into the northern Golan Heights after Israel launched a prior rare daylight raid on Syria on the “international airport, southwest of Damascus,” according to Syrian military officials. In what marks a major escalation, it appears Damascus responded to that attack with what Israeli media has called an "intentionally fired offensive surface-to-surface attack." The interception of the incoming Syrian projectile was seen over Mount Hermon, Israel’s tallest peak, which was full of visiting skiers, following a stormy period that dusted the mountain with snow. Israel's Sunday night attack has involved dozens of strikes reportedly from F-16 jets flying over Lebanon targeting locations in and around southern Damascus. Syria’s Pantsir and Buk air defense missile systems have reportedly shot down an unknown number of inbound Israeli rockets according to early unconfirmed video. SyAAD is engaging enemy projectiles in Southern Syria. Israel also reportedly launched multiple cruise missiles during the sustained assault. Local Syrians have described prolonged sustained explosions both overhead and on the ground, but it remains unclear how many Israeli rockets actually made it past Syrian defenses. The IDF has warned Syria not to respond, which appears to be unheeded as Israeli media is reporting that anti-air defenses have been activated by inbound Syrian rockets over northern Israel and the Golan Heights. The Israeli Defense Forces (IDF) unleashed a massive attack on the Damascus countryside at 1:05 A.M. (local time), tonight, hitting a number of targets in and around the town of Al-Kisweh. The reported added, "The Israeli Air Force is now launching another wave of strikes on Damascus, with some reports claiming they are hitting targets near the Damascus International Airport." 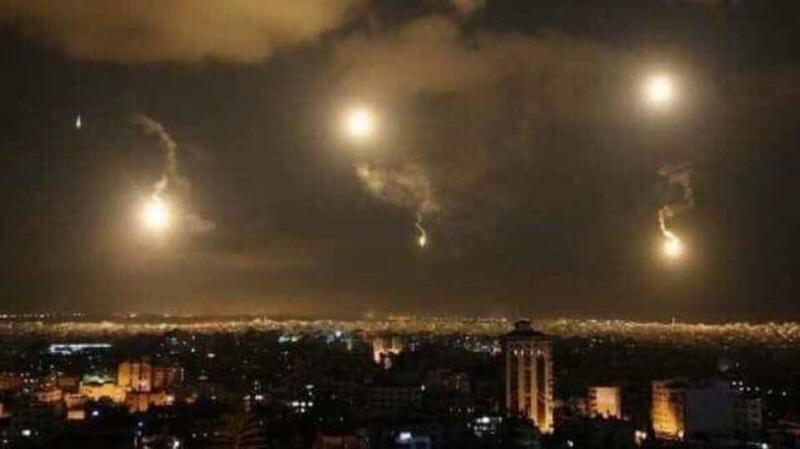 Strikes appeared to have subsided an hour or more after they began, and are reported to have included in total over 40 rockets launched in four waves.